A British research team in Antarctica has launched a long-awaited project to hunt for life in a lake hidden beneath the ice-sheet. A team of 12 scientists and engineers has begun work at remote Lake Ellsworth. They are using a high-pressure hose and sterilised water at near boiling point to blast a passage through more than two miles of ice. The aim is to analyse ice waters isolated for up to 500,000 years. The process of opening a bore-hole is expected to last five days and will be followed by a rapid sampling operation before the ice refreezes. Lake Ellsworth is one of several hundred lakes known to exist beneath the ice-sheet - its waters kept just above freezing temperature by the warmth of the rocks below. It is thought that the lake has been cut off from the outside world for long enough to raise the possibility that microbial life has evolved in unique ways. This will be the first attempt to use highly sterilised equipment to collect samples of water and sediment from a body of water so deep and isolated for so long. The aim of the project is to investigate the limits of where life is possible so preventing any contamination has been integral to the design of the equipment. Chief scientist Prof Martin Siegert told the BBC that "everything has to be done in ultra clean conditions." "We don't want to contaminate this pristine environment - and unless we keep the experiment very clean, we're likely just to measure the things that we bring down us with, which would be pointless." The engineer in charge of the hot water drilling, Andy Tait, described the operation as "huge but delicate". "Although hot-water drilling technology has been used extensively by scientists in the past, this is the first time we've ever attempted to go through 3km of solid ice - this will be the deepest borehole ever made this way. "We've fired up the boilers to heat the water to 90°C. The water pressure coming out of the hose will be around 2,000 PSI - 15 to 20 times more powerful than the kind you wash your car with. "It is the most effective way to obtain rapid, clean access to Lake Ellsworth." 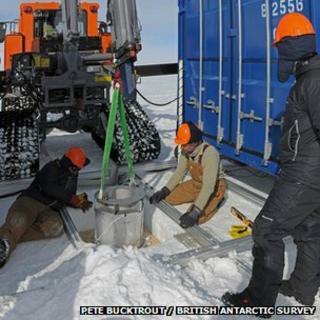 The next two days will be spent drilling out a 'chamber' the size of a caravan below the surface of the ice-sheet so that a reservoir of sterilised water is ready to prevent any lake water rising up into the borehole. Prof Siegert said that exploring for life in such an extreme environment - in pitch-black conditions under high pressure beneath the ice-sheet - could open up possibilities for life on other worlds such as Jupiter's moon Europa. "The experiment we're doing is very similar to an experiment one might do to see whether there is life on Europa. "We know Europa has an icy crust and an ocean beneath it. "If there's life on Europa it'll be living in a very similar way to life in Lake Ellsworth with total darkness, lots of pressure and using chemical processes rather than sunlight to power biological processes." If all goes according to plan in Antarctica, the first results should be announced next week - potentially a landmark moment in polar science.